Russia has ordered an "urgent" evacuation of it's drifting ice station known as North Pole-40 that sits on top Arctic sea ice, because of disintegrating sea ice that is posing dangerous conditions to reseachers. This is one more indication that the thickness of the ice is now getting very thin at places it was not before, a metric not fully captured in the extent and area data. The scientific research station was placed on the ice floe in October 2012 and was planned to stay there until September. Now the floe has already started to break apart and the crew has to be evacuated as soon as possible. Russia’s Minister of Nature Resources and Ecology Sergey Donskoy has ordered that a plan for evacuation should be ready within three days, the Ministry’s web site reads. Donskoy suggests that the nuclear-powered icebreaker “Yamal” could evacuate the station from the floe and move it to Severnaya Zemlya. With ice levels in the Arctic reaching record lows, finding a suitable floe for the station proved to be a difficult task last autumn. The icebreaker carrying the station’s crew had to sail all around the North Pole before finding an ice floe solid enough to hold the station. None of the three floes that had been pre-evaluated from land as possible objects were considered safe enough. Also the previous shift of Russian scientists experienced problems with the ice situation in the Arctic. In late April the members of North Pole-39 had to move the whole research station to another ice floe because the first one was breaking up. Only three times has a station had to be evacuated before schedule. The last time was in 2010, when the icebreaker “Rossiya" had to go out and rescue the people on the floating station “North Pole-37” already in May. Read the rest here, or over at PhysOrg, BBC, NDTV, Channel NewsAsia and many more. Let's hope the evacuation is a success. The head of Russia’s high-latitude Arctic expeditions Vladimir Sokolov said "currently there is no threat to personnel". The Yamal nuclear-powered icebreaker is scheduled to leave for the drifting polar station on May 31, and it will take the ship about 10 days to reach NP-40. The current position of North Pole-40 is close to the minimum ice extent boundaries for both September 2007 and September 2012. If that area is already melting it raises the possibility that the 2012 minimum ice extent in that region might end up considerably closer to the pole. Phooey, I was hoping the Arctic Sea Ice Blog community could pool enough donations at PalPal to send Neven on a well-deserved junket to the North Pole. Lots of activities such as practising kayak self-rescue and determining camp ice thickness and temperature of underlying sea water. Although the 'Camp Barneo-2013 costs up to $35,000 per visitor, with this evacuation, I was thinking those tickets might now be discounted to tip jar levels. However it is not an option: the camp closed a week earlier this year, on April 25 due to faster ice melt at 89N. I rotated and rescaled the North Pole-40 (yes, that's abbreviated SP-40) drift track onto the 23 May 13 Jaxa color image of the ice. This does not quite have the resolution needed to pick up the camp's ice floe, which has crumbled into 6 pieces. It does seem to be still located in multi-year ice for what that is worth (less and less each year), not quite centrally but nowhere near its perimeter either. Wow A-Team you forever amaze! I think your graphic would make a nice momento for the Russian scientists who had to abandon North Pole 40. Something they can give their grandchildren and say, "Da! See little Anatoly, there once actually enough sea ice out there that we actually had camps on it!" fi. Readers -- and marketing people -- will be the judges. few years with his climate-themed shows and exhibitions overseas, from Tuvalu's beaches to a United Nations climate conference in Doha, Qatar in the Middle East. will teach early next year titled "The Cultures of Climate Change." of American writer Nathaniel Rich and British writer Daniel Kramb)." Menager adds: "We will foray into the methods of documentary literatures and film, drawing theoretical insight from primary texts including Darryl Cunningham’s graphic narrative essay on GCC from ''Science Tales'', the film ''Sun Come Up'' (directed by Jennifer Redfearn in 2010), Ursula Biemann’s videography project ''Deep Weather'', and the web archive ''The Canary Project''. LeMenager is an associate professor in the English department at the University of California, Santa Barbara, where she has taught since 2000. September, will be part of this new genre. OK, that seems kind of... omen-like. Right. "Ominous." Now I remember the word. Now Neven you know this will be discarded as "not new" and "has happened before", so it's not "news". Do you remember the swathe of books which came out in the 1970's, turned into films, which were in response to the original worries about climate change. I believe the first flush of expectation in the sci fi world has slowed. We now understand that the barrier between a mechanistic advance and a quantum physics advance is exponentially different in time and effort. We also, now, seem to understand that the climate fights back. That it won't be overwhelmed quite so easily. But we also have 7bn people on the planet now and that brings new insights into our future in a changing climate. In the end I wonder if human stupidity will outdo the imagined reality of the novelists??? You probably know this already, but there is a rather good reason why the Russians use the abbreviation SP for this floating observation station. At least one episode of Science Fiction Theater ... meteor strikes hurricane, really spins it up, to an otherwise impossible iirc 230 MPH. The Long Winter by John Christopher - more of a social commentary than sci fi though. Coming up on June 7 is the movie After Earth. A father and son crash land on a post global warming earth and try to survive. In the words of the Father "Everything on this planet has evolved to kill humans." My regular readers will know that I haven't written much because of RSI - it was too painful to use the mouse. I have been playing catch up for a while now. Thanks to A-team's winter animations, we can guess that the only solid place left in the arctic for North Pole-40 is the goats head. Being an old goat myself I would like to find out more about this object. The goat's head is currently parked over the pole. Since it is multi-year ice, we won't have the drama of open water at the North Pole at peak melt if this situation persists. However multi-year ice visco-elastically 'relaxes' like cold paint as it warms and as buttressing first-year ice is removed, I expect the goat's head to ease back towards the Siberian shore as the season progresses. What's left of it. The left horn may be degrading. The goat's head forms an easily recognizable marker on the periphery of the main body of multi-year ice that can be tracked for 3-4 years. As an extended asymmetric form, its rotation can be measured along with translation (unlike buoys which are translation-only). Mass balance buoy 2012J was placed in 1.09 m ice in the Laptev Sea 25 Aug 12 by the Polarstern very near and possibly in the outer goat's head. Neither the ice bottom sounder nor air pressure instrument have been working since mid-December but from thermistor data, the ice now is 1.94 m thick and the snowpack is still 0.26m with air temperature -4.63 ºC. The first animation shows its movement since 08 Sep 12 at weekly intervals, then daily the last ten days using Ascat microwave. The second animation is a blow-up of motion from the first of March to today using Jaxa color imagery. Last year there were buoys that were in the location where the goats head is now. Those all got flushed out the Fram last year. We may be watching the goat's head on its final journey. Indeed, it may get flushed out, melt, be sheared apart, or otherwise disintegrate. However it has survived even more extreme positions vis-a-vis the Fram's preconditioning zone in years past. Looking at the buoy 2012J spreadsheet, it was placed at noon Aug 25, 2012 at 82.8804 N and 49.9423 E. Since Jaxa was operational then, the longitude can be accurarely located on the image using the angle measure in Gimp, with latitude scaled relative to the number of pixels to the 70th parallel which exactly grazes the inlet peninsula of a Siberian bay near Wrangel. The center pixel in the pink circle below is my best estimate of where the Polarstern placed the instrumentation -- neither Jaxa nor Modis has nearly enough resolution to match the emplaced GPS. Today the buoy lies 89.3248 N 59.3325 E which lies within the blackout zone of polar orbit satellites (which for Jaxa is 89.18 N). The buoy was last visible to Jaxa on 01 May 13. Thus it would not be difficult to track the evolving microwave properties of the ice in which the buoy sits over those dates, though the satellite resolution is not quite there. I expect the goat's head to ease back towards the Siberian shore as the season progresses. Hi A-Team, hope you had a great time in Utah. Look at the GPS Track history for O-Buoy 4 & 6 (.csv data files are available). 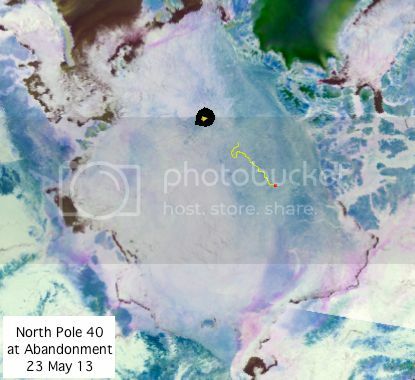 Indeed, N. pole sea ice is riding the Marrakesh Express to the E. Greenland sea. Expect the Goat's Head to pass through Fram strait by September. We should have got off that express train back in '69. And it too late now for covers. P.S. Happy to my friends in the USA. Let's take a moment to remember all those that sacrificed so that we could have freedom. Thank-you for your service. 1) What the ACNFS model forecasts is not how things play out, at least not in the short term. It looks spectacular, but the observations don't. We discussed this rather extensively in the past couple of days in the If this is real... and New map on the block posts. 2) The same goes for changing colours on the Uni Bremen SIC maps. Only when they stay in place for 3 days or more, is there something going on. There's always a lot of yellow, green and pink swathes appearing one day and then disappearing the next. That's just clouds and/or melt ponds or other stuff fooling the sensors. 3) It's not the first time the Russian ice station gets evacuated. It happened three times before according to the Barents Observer article I link to above. According to CRREL buoy 2012G that is located next to the Russian NP-40 the cyclone has bottomed out at around 987 hPa. Could've been worse, but could've been better too. I said this before, but recently I translated a documentary by the French guys who tried to sail straight across the ice pack, from Barrow to Svalbard, with a catamaran with skis under it (to sail over the ice). In it they also show footage of a storm they were in (I reported it at the time as it showed some spectacular flash melting, for which it is now too early), not too far from where the Russians are now. They found an ice floe that looked big and strong enough to withstand the storm. It was 100 square metres before the storm, and just 15 after it. The big difference of course, is that the French guys were in the storm towards the end of August, and now it's the start of may, so hopefully the ice floe(s) the Russian research station is on, are strong enough. @Neven thx for kind words. I don't know if you've already discussed this, but what I was particularly interested in was the way he discussed particular areas (Northern Maritimes, Barents/Siberian Seas, NP) and their possible differences in melt given less thickness in that area right now -- which is likely to determine both area and volume outcomes compared to 2012 in Sept. To put it colloquially: If it's thinner now in the areas that haven't yet melted out in past years, then the signs aren't good for a 2012-type Sept. result -- and the cracking leading to more side melting could counteract lower initial temps. Am I missing something comforting?